The glow becomes a dazzling aureole as it draws near. It looks like the dragon’s mysterious visitor is shining with an intense inner radiance of his own. Adalon has to strain her eyes to discern the facial features of her guest, but to her puzzlement she discovers that she still cannot see them, as the light is bright enough to blind even her excellent sight. The only definite trait that she can make out is the approaching humanoid’s height: whoever it is, the creature could not be a drow or a deep gnome since both races are much smaller in stature and build. She is awed despite herself - her recent nightmare is only too vivid in her memory. The dragon addresses her visitor in Common, but the intruder continues to approach silently, without paying any heed to her warning. Adalon’s fury at this brazen display of contempt surges in a powerful wave, and she raises her head, taking in a lungful of air to immobilize the creature with her paralyzing breath, ready to follow with a deadly barrage of spells if the visitor turns out to be dangerous. But just when the dragoness opens her jaws, and is ready to unleash the whole force of her anger, the offender finally speaks out. “That she may have done, Bright One, I am not arguing that. Yet, it was between her and the Seldarine, and who are we to judge?” The Exile’s voice sounds strangely soft, like a lover’s murmur. His bright halo subsides, and Adalon can finally see his visage, although it is still blurred. To her greatest surprise he looks exactly the way she remembers him from the days of their youth - the smooth arrogant features of the perfect face that had captured the imagination of the Queen seem untouched by the ravages of time. His frame is powerful and supple. His dress is a soft tunic of grey silk - the clothes he had always favored over the green and bronze finery of the Queen’s court. On the whole, he looks like a young, spirited elf in his prime. It is a bit puzzling, since Adalon expected him to age over the years of his exile, after his elven immortality was stripped from him along with his elven spirit. “You look unchanged,” the dragon offers to the renegade after a brief pause. Adalon is visibly wary of her visitor, and rightfully so. She remembers only too well what magnitude of magical powers he can unleash at a wave of his hand. Now the dragon wishes that she had not let him come that close, her eggs may be damaged by the side effects of the magic battle, if she provokes the Exile. Joneleth raises an eyebrow in a gesture all too familiar to her, and surprisingly the dragon feels a painful lurch in her chest. They have shared a long history together that is hard to discard. The Exile was the one who had taught her the first syllables of the elven tongue, when she was the green youngling, and he the brilliant young magician, the golden boy adored by the entire city and the beloved of the Queen herself. That was a very long time ago, well before she had met her fiery, hot-headed dragon mate, who was later treacherously slain by the drow. Adalon meets the fallen elf’s eyes squarely, but the renegade’s cold blue stare is as steady and unblinking as her own, and after a few moments of this silent battle of wills the dragon gives up and shifts her gaze away first. “What do you wish of me, Exile?” Now Adalon sounds harsh even to herself, but she has to remain steadfast in her resolve: the Exile is cunning, and she wants him out of her lair as quickly as possible. His voice sounds almost tender now, and Adalon is touched despite her best efforts to stay rational. Her former friend looks genuinely distressed. He goes on with his story, telling her how the many years of exile had opened his eyes to the utter perfidy of his crimes, and how his genuine regret slowly turned to remorse and repentance. How finally, after decades of humiliating misery, he was pardoned by the Seldarine and restored to his former self. The mage is so eloquent in his beautiful tale of redemption and triumph of good over evil that she cannot help herself - her heart begins to thaw. Adalon has been lonely for such a long time, and her sorrow has weakened her resolve. The dragoness knows very well that at the end of his career the Shattered One had turned into a power-hungry maniac, thirsting only for more of the same narcotic, feeding his addiction on others’ misery. In her heart, Adalon will never understand why Ellesime spared his miserable life. But as he has said - is it for her to judge? His crime had not affected her in any way, since she was not in Suldanesselar at the time when he had tried to drain the powers of the Tree of Life. If the elven gods have forgiven him - maybe they knew him better? The Exile notices her hesitation. Would it be possible for him to remain young and beautiful if not for his restoration - Joneleth asks her gently, and suggests that she tries her divination magic on him. Adalon’s arcane powers may not be as strong as her guest’s, but she has her own assets. The ‘true sight’ is the most reliable of the divination spells, and the dragon has a small cache of valuable scrolls, one of which she is ready to sacrifice. But when the magic is cast, it reveals no deception, and the dragoness begins to relax. Furthermore, she had heard rumors that the removal of the spirit causes the subject to lose his ability to feel - the fate she considers worse than death. Yet, the Exile does not show any adverse effects, as his voice rings with conviction, sadness and just the right touch of embarrassment, when he speaks of his past. There is even a genuine tear on his face when he speaks of his lost love. The only reason for his visit today was to ask her to become a mediator between him and Queen Ellesime, he implies. That last appeal is enough to vanquish most of her suspicions - no soulless being can be that convincing. In the end, Adalon agrees to help him, since what he is asking sounds sensible enough. When the elves next come to bring her nourishment, she will send a message to the Queen, asking her to visit the temple of Angharradh built on top of the entrance to Adalon’s underground lair. There the Exile and his royal lover would be able to meet away from the prying eyes of the crowd. Adalon is pleased with herself - she has solved a difficult problem without compromising the safety of her eggs. Joneleth seems delighted, although the dragon notes a fleeting expression of annoyance flicker in his cerulean eyes. Noticing her concern, the repentant elf immediately apologizes for his impatience. He has waited long enough, but now that their reconciliation is almost at hand, he can barely control his feelings for the Queen. Adalon is impressed. A sudden fancy comes over her - in a gesture of apology for her mistrust and of future goodwill, she offers to show him her unborn children. The eggs are safe enough in their stone nest, and what is the harm in letting Joneleth see them, when she is at his side to watch over them? She leads the fallen elf deeper into the heart of her lair. There they are: in a carefully arranged circle of polished stones lie two perfect silvery ovals, simmering with quiet life. Dragon eggs take almost a year to incubate, and Adalon’s children are almost ready to enter this world - they will hatch in mere weeks, if not days. No one can stay indifferent at the sight of the greatest mystery in the universe - a new life striving for existence, and as the properly impressed and mollified mage approaches the nest, an eerie smile of delight blossoms on his pale lips. Joneleth bends over the nest as if to have a closer look at its contents, and says a single world of command. Adalon’s heart stops in her chest - but it is too late! It has been too late from the moment he had entered her lair. The mage’s hands sprout a web of power lines that spring forward enveloping the nest in a tight knot of flickering green light. Adalon can see her eggs spin within their entrapment, as the cocoon woven of magical threads rises from the nest and hangs suspended in the air. “If you kill me the released power of the magic trap will destroy the eggs,” the traitor says quickly even as Adalon’s jaws open to snap around his slender frame. She freezes in half-motion, paralyzed with the fear and shock of his betrayal. How could she have been so gullible? It is now obvious to her that he had planned this from the start. But even as the frantic thoughts rush through the dragon’s mind, the mage speaks again. The Exile’s body begins to change even as he speaks - his form becomes larger, and acquires the distorted proportions of the magically enhanced construct. Even as Adalon watches in rising panic, the traitor’s face solidifies into an oddly contorted leather mask. Only his eyes remain the same - the coldest shade of blue ice, although his pupils are dilated, and glow with a virulent green light - a sight more frightening than all his other transformations. The mage waves his palm, and the trap with the dragon eggs floats into his hands. “One hostile move and your eggs will become a fine omelet,” the traitor warns her in the same kind and collected voice that he used to charm the dragon into believing in his ‘redemption’. “I have no taste for dragon eggs, but there may be other... connoisseurs. However, you may still have a chance of getting these back, if you ‘behave’. All that is required from you for now is to ignore certain activities of my dark-skinned allies from Ust’Natha. You will be further notified of my exact conditions.” And with these final words he twists a ring on the index finger of his hand, and teleports away taking with him Adalon’s future, and leaving her heartbroken and half-mad from grief over her stolen children. I came back to my senses sprawled on the floor of the cave, and it took me a few minutes to remember where I was. The place in which I found myself was pitch-black, there was not enough light here even for my sensitive elven eyes. I could still feel the motion of the air, but the gray gloom of the tunnel outside was replaced with the absolute darkness of the inner cavern. The air smelled vaguely of something harsh and metallic, like vapors of mercury. As the stark reality of my situation slowly dawned on my mind, I suddenly wished I had not woken up at all. The whole idea of entering the dragon’s lair to obtain information about my past was crazy enough, but now that I knew at least part of the history between my former self and Adalon, it sounded like the last act of a spectacular suicide scenario. Would I have done it anyway if I known the truth from the start, I asked myself? But perhaps, I should have considered the predicament I put myself into from a different angle, mainly: was the price of recovering that particular bit of my memory really worth it? Perchance, the life of a nameless exile was a better choice after all? But no, the sting of curiosity and ridiculous childish pride for my former nefarious self had already entered my heart, and it was poisoned with the unholy desire for more information about my past. For all its iniquity, the trick with the dragon’s eggs captured my imagination, and I began to feel a certain admiration for Joneleth and his wicked ways. There was of course also the matter of the ‘sister’… The bloodthirsty devil, with heart as black as her raven locks, and eyes the color of cobalt tainted with vermilion; she, who was waiting outside while he was walking down the long dark corridor toward the dragon lair to steal Adalon’s greatest treasure. I remembered my other dreams and visions of that perfect face as similar to my own as a reflection seen in a twisted mirror. Was she dead or alive? Perhaps - both? In one of the later nightmares, she had said she was coming for me. That was the same dream where she claimed that once upon a time I had rejected her proffered gift of undeath, despite my irrational fears of oblivion. That was most curious. Were we bound in some unholy way, or was it another dead end leading nowhere and meaning nothing? I shrugged. I had enough on my mind at the moment without wasting my time on portents that might never materialize. I had no doubt that the ‘hidden’ entrance was really a magical trap - that information was firmly impressed on my mind together with the dragon’s stream of memories. Was Adalon that paranoid about Joneleth’s ability to find her lair even in these gods-forsaken mountains, that she absolutely had to set her guards against him, I thought with a certain pride? Well, if she was, then the dragoness should be pleased with her own cunning, for she had got me exactly where she wanted. I was quite helpless, stripped of my magic, and locked inside a very dark place in the company of two dragons, with both of them no doubt set on ending my life in the most painful and undignified manner. Remarkably, the prospect of dying did not frighten me per se, since there is only so much that any mortal mind can take without losing its fear of death, and by then I was long over the limit and firmly in the uncharted territory of reckless insanity. Plus, I had all reasons to believe that I had been dead once before, and repetition tends to take the zing out of even the most exciting experiences. But I did not like the idea of being tortured before the execution, and my nightmares during the first few months of my stay in Chyil’s care were full of gruesomely detailed procedures of that particular nature. In my dreams, I was repeatedly dissected, flayed alive, burned to a crisp with electric charges, or drowned in a nauseating solution of something akin to formaldehyde, which singed my eyes and mouth before filling my lungs with globs of caustic liquid and making them explode in bursts of searing agony. I doubted the dragon was half as inventive as my own imagination... Still, her fury at discovering me in her lair would be hard to overrate. I sat upright on the cold stone surface, hugging my knees and trying to wrap my limbs tightly around myself, reducing my body to a neat ball of shuddering flesh. It was rather drafty in here, and I felt neurotic shivers run down my spine in rapid succession. It took a great exercise of willpower to control the chattering of my teeth. I knew I could not sit here forever, agonizing over my past mistakes and wondering about my future. Sooner or later, I would have to get up and look for an exit and a way to deal with the other occupants of this place. A sudden thought entered my vacillating brain in the pause between two long humiliating fits of shivering: if the trap was set for me in particular there was not a single chance that Adalon would be unaware of my presence by now. Yet, she did not rush out to investigate, despite all the noise that I had made falling into her lair. For that matter, neither did the Blue Dragon. Were they both dead or otherwise incapacitated, or was it another way to torture me - with my own mind filling the role of an executioner? Moreover, did I really want Adalon to be dead? The idea of my predicament being resolved in such a simple manner did not cheer me up. Quite the opposite, the thought filled me with a dreadful chill and emptiness as if after all the hassle of my inner struggle I was about to be cheated of my destiny. I sprang to my feet cursing softly to myself, and struck my skull on the hard protrusion of a rock. For a moment, my head was filled with bright explosions and shooting stars; then I recovered my wits. If I was to get out of here alive and learn the fate of the silver dragon, I had to be careful, and stumbling randomly in the dark was not the way to start my explorations. It was at this particular moment that I finally became aware of the humming. It was so feeble and monotonous that at first I had taken it for the whistling of the wind in one of the smaller conduits in the stone barricade which filled the passage behind my back barring the exit from the lair. Then I realized that it was coming from a different direction. It was a very thin and eerie sound, bordering on the line between the noise that a human babe would make when it is wet and hungry, and the angry droning of an enormous insect. I could imagine a giant wasp or a bee buzzing like that when pursuing its enemies or fending off an attack on its nest - but definitely not a dragon of any kind. Faerun is a dangerous place, and many peculiar creatures haunt its caves. Yet, I would have expected the dragon lair to be free of parasites while its owner was in residence. Had anything moved into the cave in the short period that has passed since the Iryklagathra’s attack? The Umber Hulks and giant spiders are the omnivorous and omnipresent menace of the underground tunnels and dungeons, especially when it comes to disposing of dead bodies. The idea of a giant bug waiting for me to stumble blindly into its mandibles filled me with revulsion. There was only one remedy for that, and I decided to take it and damn the consequences. A sphere of blue light sprang from my opened palm and floated up to the ceiling, filling the gloomy chamber with its soft radiance, and after a few seconds of ensuing blindness, I was able to examine my environment. I found myself in a small appendix half-filled with stone debris, branching from some larger corridor that led further into the inner recesses of the lair. Nobody had attacked me yet, despite the summoned light source; however, the annoying sound rose in pitch and acquired a certain hiccupping quality. For unknown reason, it filled me with grim foreboding. There was something about it - a certain note of ultimate despair and sadness that troubled even my fairly cynical heart. I crept out of my hiding hole into the larger tunnel, which after a few dozen careful steps brought me to what was its final destination - the sacrosanct heart of the dragon lair, the most protected inner vault. The chamber was so huge that my pitiful light was not enough to illuminate all its vastness. All I could see at first was a semblance of rough stone staircase cut into the side of the giant elliptical depression in the floor. Along its perimeter, I could discern a tangled mass of giant stalactites; some of them were carved to resemble a colonnade supporting the tall ceiling. I assumed that the work was done by humanoids. Maybe the ancient silver dragon, who had occupied the Gaping Cave eons before Adalon, employed his allies for the job. I moved to the edge of the recess, judging it to be the dragon’s equivalent of a bed within an alcove. The annoying buzzing sound continued to come from below and even increased in volume. After some short hesitation, I sent my small sphere of magic light floating down to the ground level. In its feeble glare, I was able to appreciate the extent of the devastation caused by the Iryklagathra’s invasion, and my spirit sank in dismay. It looked like the two dragons had fought their final battle amidst the riches of Adalon’s hoard. The bottom of the pit was strewn with blackened coins and partially molten pieces of various treasure: plates and cups of gold and silver, ancient swords and ornate pieces of mail, chains and necklaces entangled with torn and singed remains of opulent garments once upon a time bespangled with precious gems. On top of this monumental wreckage rested two humongous bodies of the fallen enemies - the dark indigo bulk intertwined with the bright silver one, wings torn and shredded into ribbons, tails swiveled together in the last throes of mortal struggle, terrible claws plunged deep into the opponent’s flesh, sword-sharp teeth sunk forever into the enemy’s torn and bleeding throat. In horrid fascination, I looked at the immense pool of dark blood congealed over the pile of coins that served as the last resting place for the two slain combatants. Its tangy metallic stench filled the entire chamber and wafted down the side tunnels. That smell was the first thing I had tasted upon my awakening, although the true meaning of it remained hidden until now. Slowly and carefully, I approached the scene of the carnage. Since the globe of conjured light was insufficient to illumine the entire cavern, my visibility was poor, yet I felt awed and strangely reluctant to bring more light into this house of death. The weird buzzing became stronger, reaching its grotesque crescendo as I began my unhurried descent down the vast staircase. At the third step down, the sound stopped abruptly, and I discerned a streak of motion on top of the silver dragon’s body. Some small but agile creature was climbing down Adalon’s scaly bulk, and I realized with growing unease that it was probably the source of the wailing that had bothered me so much. I made a step back, ready to repel any possible attack with my pathetic selection of spells, and froze. 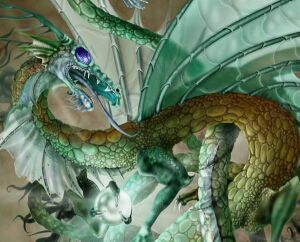 The thing that was stumbling towards me on four fragile paws was an exact replica of the silver dragon - a sinuously curved statuette with a pair of semi-transparent wings, eyes like two pools of liquid metal - except it was about three feet tall and about five feet long, counting the tail. I stared back at the wyrmling in irritation and bewilderment. The idea of its existence had never occurred to me, although I vaguely remembered that in the flashback vision of my ‘despicable’ crime Adalon’s twin eggs had been almost ready to hatch. It explained the silver dragon’s delaying tactics during the fight and her desperate dash back to the cave after Iryklagathra’s act of reverse trickery. I quickly scanned the chamber for the second hatchling, but there was none. Perchance this was the only one that had survived the attack on the lair? The small dragon took a few hesitant steps forward and stopped, staring at me with an indescribably sad expression in its bright metallic eyes. Unlike its mother’s, the hatchling’s hide was bluish-gray with only an occasional silver sparkle that gave the creature a rather toy-like appearance. The facture of its wings - thin and glassy, like those of an overgrown dragonfly - only added to the effect. It looked thin and desperate, and was obviously seeking some sort of solace. I wondered why it was not afraid of a humanoid, but decided that speculating on this matter was a waste of time - it would only make me feel involved, and the last thing I wanted was to be saddled with any sort of obligation towards yet another adolescent. Yes, taking care of orphaned dragons was definitely not on my list of priorities. As if the human twins were not enough of a burden! The wyrmling was welcome to follow me out of the cave if it so desired, but I doubted that a dragon that young would be able to survive if left to its own devices. Perhaps the halflings could take it in, to honor their alliance with its mother? Adalon had, after all, been their so-called Protector, if not the most efficient one at that. As I studied her pitiful offspring, I tried to sort through my thoughts and feelings, and found myself in a bout of anticlimactic depression. What had been the point of my reckless behavior, if the potential source of information about my past was now dead? The whole thing was quickly turning into another tasteless joke of fate. At least it looked like the eggs had been returned to the dragon, (although I could not comprehend how), unless, of course, this was an entirely different clutch. Adalon had mentioned that her mate had been murdered by the drow, and I doubted that a dragon with a haughty and finicky attitude like hers would pick another partner right away. Was a hundred years long enough for her to mourn? Two hundred? A thousand? I did not know for certain, but had a shadow of a memory that silver dragons mated for life, and usually remained lonely after losing a spouse. Establishing a reliable timeframe based on a few vague dreams and speculations was like predicting the future by looking at the pattern of tealeaves. Except that the tealeaves were more reliable, and left less to the imagination. The wyrmling looked very young, so assuming it had indeed hatched from one of the hitherto stolen eggs, the whole ordeal could not have happened more than two years ago. The question was - how to fill the gap between then and now? Adalon’s death robbed me of that opportunity. I nodded in the little dragon’s direction, making generic soothing noises that I deemed appropriate for the occasion. My situation was precarious enough without antagonizing it. Moreover, if I befriended it, it might show me the way out and save me the time that I would otherwise have to spend looking for the exit. The wyrmling lowered its long neck and hissed softly in return. Something in its serious, unblinking stare made me aware of the fact that behind the toy-like, fragile appearance lurked a brave and curious intellect, and a real personality. Was it already able to understand spoken languages? I knew dragons were a highly intelligent species, however judging by its size the wyrmling could not have been more than twelve to eighteen months old. I had no idea how young dragons were reared, but was aware of the fact that at this relative age a human or an elven child would be a mewling blob of flesh, constantly in need of being cleaned and nourished. Still, the wyrmling's plight was not my concern, regardless of its possible intelligence, and I decided to establish this fact from the start. “If you want me to help you, you will need to cooperate.” I said in a neutral but firm voice. If the wyrmling was indeed sentient, it should be able to understand the intonation. A long shudder ran through its body and I saw a sparkle of comprehension and hope light the huge silver eyes. The ring on my little finger pulsed with an influx of warmth, and a row of flickering images assaulted my brain as the creature issued a series of rhythmic hisses and roars. Friend? I winced. In all honesty, the impact of that statement was like a smack on the face. Could it speak Elven? Or rather... could it think in Elven? Had not Adalon mention in the vision that Joneleth had once taught her the basics of Quenya? “You are called Arozth’miamlath?” I tried to reproduce it - but of course my tongue was not able to duplicate all the proper roars, clicks, and hisses of her draconic name. Even though, thanks to the ring on my finger, I understood the meaning of it: something akin to ‘the first star of the morning’. Which fact made me realize that most likely the wyrmling was female. However, I dismissed her testimony of Adalon’s aliveness right away – obviously she insisted on it because she wished it to be true.